If the stationarity condition is not satisfied, a nonstationary model (a differenced model or an error correction model) might be more appropriate. Figure 35.44 shows the output associated with the ROOTS option, which indicates that the series is stationary since the modulus of the eigenvalue is less than one. with vec denoting the column stacking operator. where converges in probability to and denotes convergence in distribution. The (conditional) maximum likelihood estimator in the VAR(p) model is equal to the (conditional) least squares estimator on the assumption of normality of the error vectors. As before, vec denotes the column stacking operator and vech is the corresponding operator that stacks the elements on and below the diagonal. For any matrix , the commutation matrix is defined as ; the duplication matrix is defined as ; the elimination matrix is defined as . where is a matrix and is a companion matrix. The variables are said to cause , but do not cause if . The implication of this model structure is that future values of the process are influenced only by its own past and not by the past of , where future values of are influenced by the past of both and . If the future are not influenced by the past values of , then it can be better to model separately from . 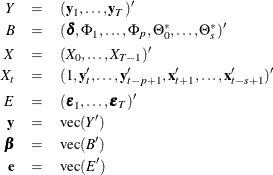 For the Granger causality test, the matrix C consists of zeros or ones and c is the zero vector. See Lütkepohl (1993) for more details of the Granger causality test. 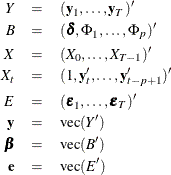 The conditional least squares estimator of can be obtained by using the same method in a VAR(p) modeling. If the multivariate linear model has different independent variables that correspond to dependent variables, the SUR (seemingly unrelated regression) method is used to improve the regression estimates. As you can see in Figure 35.45, the symbol ‘_’ in the elements of matrix corresponds to endogenous variables that do not take the denoted exogenous variables.